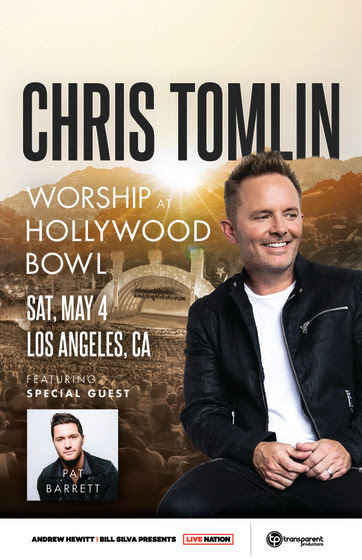 Chris Tomlin has announced a concert at the Hollywood Bowl, Worship At Hollywood Bowl, on May 4, 2019, in Los Angeles. The show will coincide with Tomlin’s birthday, and feature Pat Barrett as special guest. Tickets for the West Coast concert will be available Monday, Sept. 10. Tomlin’s tours have sold out notable venues across the country including Madison Square Garden, The Forum in Los Angeles, and Red Rocks in Denver, among others. His 2018 spring arena tour, “Worship Night in America Tour” wrapped in May, gathering over 175,000 during its six-week run. This Fall, Tomlin will release a new studio album on Oct. 26, HOLY ROAR, along with a companion book Holy Roar: 7 Words That Will Change the Way You Worship, set for Oct. 23.